Types of Garage Door Openers: When you decide to buy a garage door opener it can be a bit confusing and tricky as to which garage door opener is the best. 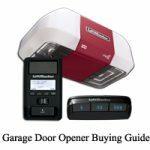 There are different garage door opener types available in the market. Unless you know the difference it can feel like a shot in the dark. I have tried to figure out the differences so that it can help you to decide which garage door opener is best suited for your home. Chain drive garage door opener uses a chain to pull or push a trolley that moves the garage door up and down. It is the most commonly used garage door opener.it is cheaper than other garage door openers. It is very much safe and secured. However, they tend to be a bit noisy.it works best for a detached garage. It is a good choice for standard aluminum doors. It needs periodic maintenance. Belt drive garage door opener uses a belt instead of a chain to move the garage door up and down. It is more expensive than chain drive openers and it is more expensive than chain drive garage door opener. It produces lesser noise than its counterparts. Moreover, it is ideal for an attached garage. It needs periodic maintenance. Screw drive garage door opener uses a long screw to move the trolley which moves the garage door up and down. It needs less maintenance than other garage door opener because it has fewer components. Also, it has one drawback that it produces so much noise than its counterparts. It is a great option for wider and heavier doors. Nowadays, smart garage door openers have taken over the market with their ease of use and less maintenance. Smart Garage Door Opener is a Wi-Fi enabled garage door opener that offers a wide range of monitoring, control, and customization options.it has remote access and monitoring features in which garage door can be opened or closed from anywhere with the help of an app on your phone or tablet. t can be easily integrated with a smartphone network. It uses different modular smart accessories like a Bluetooth speaker, an adjustable fan, a dual-laser paring assist module, and a carbon monoxide sensor. Remote Garage door opener has been here with us since long time back. The first generation of remote garage door opener had a transmitter and a receiver. The transmitter will transmit a radio frequency and receive will listen to that radio signal, thus opening or closing the garage door. But due to low power and limited range, the transmitter signal would be received by other nearby garage door openers. With the advancements in technology, a frequency range of 315 MHz was set for this. A rolling code was employed to solve the problem of code grabbing in which a different code was sent from the previous one thereby unlocking the door. Transmitter sends ‘next’ code in sequence. The receiver compares the ‘next’ to its calculated ‘next’ code. Besides these types of garage door openers, there is one more type. It is Jackshaft garage door opener. It moves the door up and down with the help of a motor that is attached to the side of a torsion rod which spins up and down. 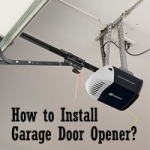 The main benefit of this type of garage door opener is that it saves space from the ceiling. But there is one drawback. The garage door must be installed with a torsion rod. Keep visiting our Garage Door Opener portal regularly for latest updates.